Homemade gnocchi…A labor of love. Ever since coming home from my honeymoon in Italy, I have been dying to try homemade gnocchi. I had the most amazing gnocchi when staying in Positano at this family owned restaurant named Ristorante da Vincenzo. It was so good, we went back two nights in a row. I’ve put off making my own for a while, so the time has finally come. I followed two receipes 1. from keepin’ it kind and 2. from delallo. I combined parts of both recipes until I found the perfect consistency for the dumplings. I do not own a potato ricer. I have never heard of such a thing before until I started making the gnocchi! Guess I should have read the full recipe first! Instead, I used a potato masher. This meal exceeded my expecations! Everything about it brought me back to sitting in Piazza Navona in Rome! The homemade sauce, homemade gnocchi, homemade meatballs, even the wine and cheese were brought back from Italy (don’t tell US Customs!). There is something to be said about REAL GOOD Parmigiano- Reggiano cheese! And the wine, real Italian wine, sulfate free is the best kind. The wine came from a resturant in Positiano, La Tagliata. It’s a another family owned resturant and they make their own wine. We loved it so much, we asked to buy a bottle, but the amazing owner gave us one for free! If you can’t tell by now, I highly recommend going to Italy on your honeymoon! 1. Boil potatoes with skins on for about 20 mins or until tender when poked with a fork. Drain well and let cool. 2. Peel boiled potatoes, removing any brown spots. 3. Clean your work surface, either the countertop or a large cutting board. 4. 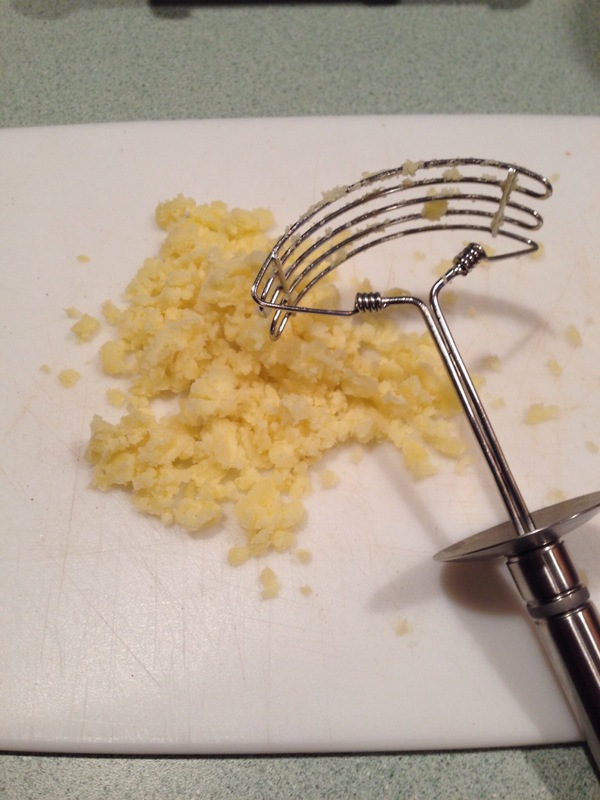 Use potato ricer if you have one, if not use potato masher to mash the potatoes. The masher worked just as well, but you really have to make sure to work out all the little clumps. 6. Clear out a circle in the middle of the potatoes and crack your egg in the middle. Beat with a fork, slowly pulling in the potatoes. 7. Time to get down and dirty! Use your hands and start mixing the ingredients until your dough begins to form. This is where I started having trouble. My dough was too wet, so I had to keep adding flour. 9. Drop the cut pieces into boiling water. Gnocchi cooks very quick! Once the pieces start “dancing” they are done. Scoop them out with slotted spoon and set aside until all pieces are cooked. A VERY HELFUL TIP!!! 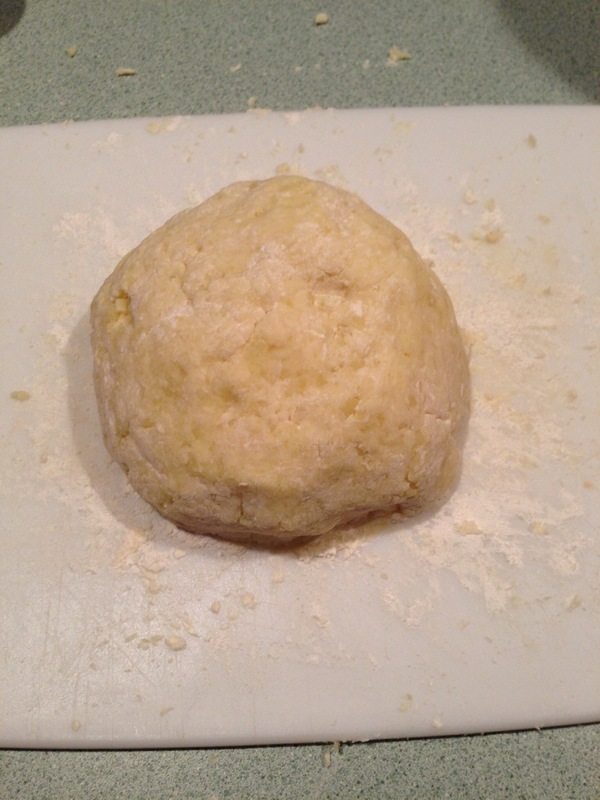 Even when you think the dough is the right consistency, roll out and cut off a small piece and test it out. If it sinks and doesn’t rise, add more flour. If it sinks, then rises, but tastes gummy, add more flour. I had to repeat this step 3x before my pieces didn’t taste gummy. Another helpful tip from one of my followers is use older potatoes, they hold less mositure. That is why I probably had to use more flour than the receipe called for; my potatoes were bought the same week. I’ve never tried making my own gnocchi at home, I’d love to try this!! Jenna- It was well worth it!